More friends and a blog: Whatever happened to Shaun Cassidy?? Whatever happened to Shaun Cassidy?? 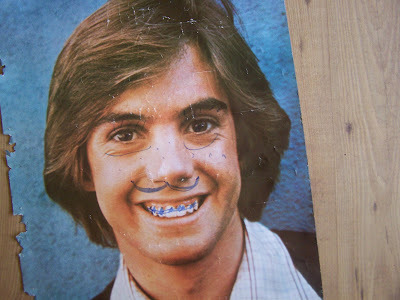 Whatever happened to Shaun Cassidy, you ask? Well apparently he grew a mustache, got braces, big bags under his eyes and loads of blue freckles. Just had to share in case the poster might bring back any fond memories for someone else. Absolutely hilarious. This made my day, Heather. Poor darling Shawn! He needs an eraser, stat! When we were renovating here we found a bottle of Captain Morgan rum in the wallboards beside the oil tank. And there was still some in it! Partay!